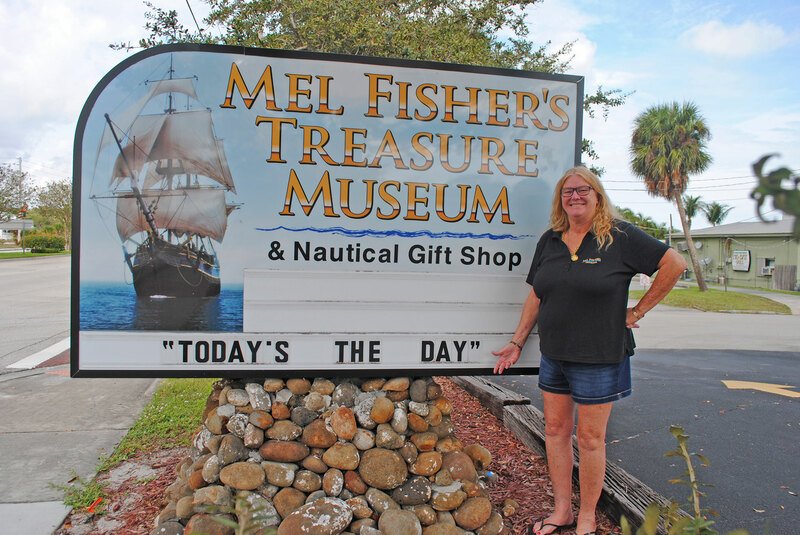 Taffi Fisher Abt, a partner in the family salvage business, had her father’s motto added to the sign outside of Mel Fisher’s Treasure Museum and Gift Shop. Much like her famous father, diver and treasure hunter Mel Fisher, Taffi Fisher Abt has experienced monumental highs and heartbreaking lows, but her relentless perseverance and indomitable spirit continue to chart her course through life. 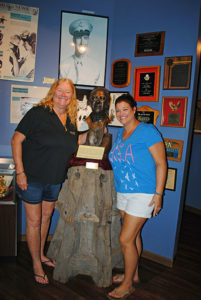 The Sebastian resident was born in California, the youngest child and only daughter of Mel and Delores Fisher, a colorful, entrepreneurial couple who had already opened the first “dive shop” in the state and introduced thousands of novice divers to underwater exploration. “I wore my first wetsuit when I was just 3 months old,” says Taffi. “The ocean was our playground and my father was the captain of the ship.” Mel had a very successful scuba diving business and even a weekly TV show in California, where he would show his underwater films. Delores set the world underwater endurance record of more than 55 hours and 37 minutes by sleeping in a hammock with a weight belt across her lap and changing air tanks every two hours. They were the unofficial king and queen of the underwater world. Yet the seductive dream of finding sunken treasure from the ill-fated 1715 Spanish Plate Fleet, which sank off the coast of Florida, lured the Fishers to uproot their family and move to Vero Beach in 1963 when Taffi was only 2. “My first memories are from living on Banyan Road and playing on Vero’s beach,” she says. “I honestly don’t remember when I learned to swim, but I was told that I nearly drowned once in the pool at the old La Posada Inn on Ocean Drive. I was later given swim lessons from Millie Bunnell, one of the original Dolphinettes (synchronized swimming group), at the old Riomar Country Club.” Taffi attended Beachland Elementary School and remembers the early treasure hunting days fondly. Mel Fisher’s team of Treasure Salvors, Inc. and the Real Eight Company joined forces in the quest for the 1715 shipwreck treasures. They gave themselves exactly one year to search with the agreement that if that year passed with no result, they would return to their previous lives. Their electronics had located the wrecks, but the divers’ inability to see in the murky water had yielded them nothing. In the spring of 1964, with only days left before their self-imposed deadline, Mel ingeniously devised an apparatus called the “mailbox” that shot a layer of clear water to the bottom of the ocean floor. While testing it, the sands parted and the bottom was paved with gold. 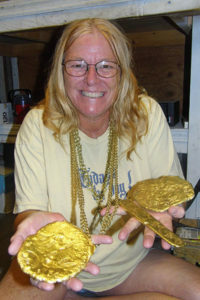 That’s when a gold rush began in Vero Beach. Abt likes to show visitors the gold discovered at shipwreck sites. When Taffi was 9, she moved with her family to Key West as her father chased an even bigger treasure from the virtually unsalvaged Spanish galleon named the Nuestra Senora de Atocha, which sank off the Florida Keys in 1622. Believed to be the richest of all the sunken galleons, Mel had found a new quest worthy of his greatest effort. After school Taffi would go down to the waterfront where the family’s replica galleon was docked as a floating museum, showcasing some of the treasure they found in Vero Beach. The tourist attraction brought in money from visitors and helped entice investors to finance the Atocha exploration. She’d spend her afternoons helping her mother at the museum and as she got older, she would crew for the salvage boats. She was always hands-on in the family business from a very young age. In 1980, ten years after initiating his search for the Atocha, Mel’s team found the Santa Margarita, a ship that was part of the sunken 1622 fleet — and it yielded millions in gold. While elated, the Fishers continued their quest for the Atocha and five years later finally found the mother lode, parlaying them onto the world stage and establishing them as the world’s greatest treasure hunters. Taffi is still a managing partner with her brother, Kim, of the salvaging companies that are still working on the Atocha, the Margarita and a few other explorations, but they’ve sold the rights to the 1715 fleet. She travels down to Key West frequently for stockholder conferences, business meetings and company parties but enjoys the laid-back lifestyle in Sebastian. Taffi turned her grief into action when she set up the Michael Abt Jr. Have a Heart Foundation with the goal of saving children’s lives through the donations of AEDs (automatic external defibrillators). “Had an AED been used on Michael, he may still be alive,” she says. “Anyone can use one and they can literally start a heart.” The foundation’s mission is to ensure that AEDs are placed in schools nationwide as well as with youth athletic program camps and other places where young people convene. Through generous donations the foundation has raised enough money to place AEDs in all Indian River County schools and provide free training for any school district employee. Cardiac arrest is most common in children playing sports with a higher occurrence among the black population and in the sports of basketball and cheerleading. “Usually the first sign is when they collapse,” says Taffi. “But it can be detected early with an EKG. Taffi now works behind the scenes, digitally archiving records from the past before the age of computers. She stays active in managing the ongoing treasure salvaging expeditions and, like her father, loves to entertain the investors. “Once a year we have huge stockholders party in Key West and we party in a fashion that would make my dad proud!” She is also working on a biography about her parents and their family’s legacy. Learn more about AEDs and the Michael Abt Jr. Have a Heart Foundation at www.haveaheartformichael.org. 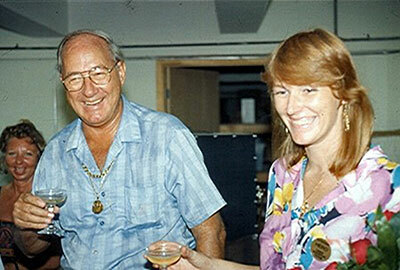 Mel and Taffi Fisher toast the discovery of the Atocha treasure. Family: Husband, Michael; sons, Josh, 34, and Melvin, 21; daughter Nichole, 34; one grandson. Education: Studied museum curation at Smithsonian Institute, Washington, D.C.; took courses in cultural anthropology, Indian River State College, Fort Pierce.